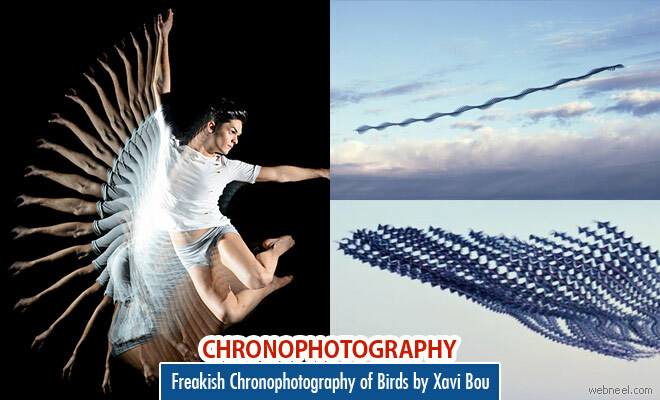 Chronophotography : Spanish photographer, Xavi Bou's motive was to capture images of birds flight which normal human eye couldn't perceive. His love for nature, particularly birds lead him to use the technique of 'chronophotography' . Xavi used this technique for his project in ornithographics. An unique combination of technical science and creativity merge to create reminiscent images which reveals the beauty of bird's movements. Art and science of chronophotography dates back to 19th century. In chronophotography, images of birds in flight, will be placed side by side, to study the movement. Sequel images of birds in motion is visualized through his photography. Xavi's ornithographics show the ripple-like beat of bird's wings, flying single or in a flock. He uses Photoshop to combine every small movement in time into single image of a bird's flight. Each frame is a visual poetry. He layers each photo to get the ripple like effect in Photoshop. The fascination with birds caught him during his long walks along with his grandfather on the delta of the Llobregat River outside of Barcelona, an area famous for its bird-watching. Xavi explored new ways to beautify his passion on birds through astonishing photography. By capturing the flight patterns and visualizing them in chronophotography, Xavi brings the hidden beauty of nature in totally different perspective. According to Xavi Bou's website,"Technology, science, and creativity combine to create evocative images which show the sensuality and beauty of the bird’s movements and which are, at the same time, clues for those wishing to identify or recognize them".